Brian, who oversees our courses in Norway, served with the British military for 25 years, specialising in winter warfare. He has represented Great Britain in X-country skiing, ski orienteering, (5 World Championships) and is a former British biathlon champion. Brian's last 6 years in the Army were as a full-time adventure training instructor at the British Outward Bound Centre, Norway. As a BASI 1 ski teacher, Brian was responsible for running BASI courses in Norway and assessing summer/winter expedition leaders for the 3 services. 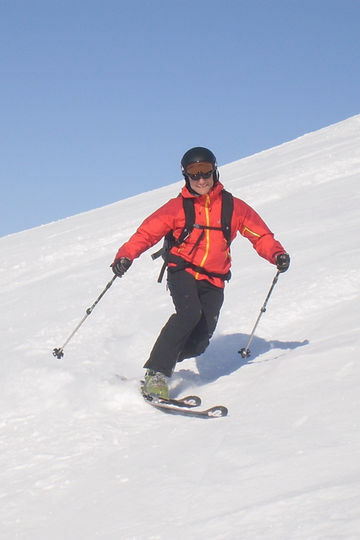 Brian has also completed a two year Norwegian Ski degree course at the University of Volda in Northern Norway. In addition to skiing, Brian has qualifications in many outdoor activities. On leaving the services in 1988 Brian remained in Norway with his Norwegian wife and their children. Brian is now the course coordinator and manager of the Joint Services Training Centre, Evjemoen, an adventure training establishment in Southern Norway. The JSTC is an all-year round outdoor activity centre for both service personnel and civilians. Over the years Brian has led over 70 summer and winter expeditions in Norway, some as long as 450kms through some of Norway's most well-known mountain areas. Brian is well recognised for his expertise, an example being asked to work as a special consultant for the Norwegian army to organise and teach Dutch special forces in Arctic warfare and X-country skiing. Brian's other main interest is Norwegian war history, particularly the dramatic and daring raid on the heavy water plant at Rjukan during the winter of 1943. Brian's intimate knowledge of this action, of the Hardanger Vidda, and his close relationship with some of the surviving saboteurs led Brian to be heavily involved in Ray's documentary, "The Real Heroes of Telemark", in 2002/3. Since then Brian has also been sought out to work on several other film projects associated with this particular action. It was a huge pleasure to work with Ray on the Telemark series and, now being involved in working with Britain's leading Bushcraft company as well as leading the most exciting and demanding battlefield tour in the world – the 'Heroes of Telemark' winter expedition. 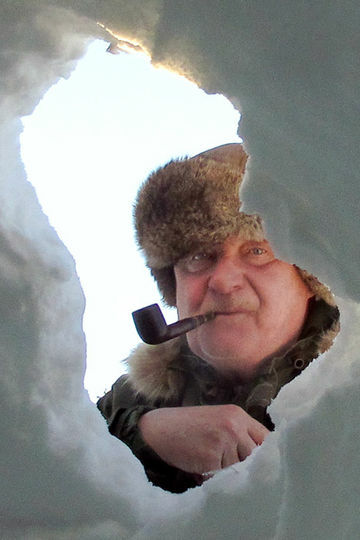 A true master of his environment, Lars has lived and worked all his life in the frozen splendour of the Arctic North and has already squeezed into one life time what many of us couldn't hope to achieve in several. For 35 years he instructed at the Swedish Army's Ranger School in Kiruna, Lapland and the Parachute Training School, Karlsborg. He has also trained with UK and US Special Forces, and in 1980 he established the Swedish Army's Survival School. As well as his military instructing, Lars has worked with indigenous peoples from such far flung places as Siberia to Canada, all the way down to Australia, and is also the author of 8 books on Survival and outdoor skills. As if that wasn't enough, Lars has also completed many arduous journeys across the frozen North, one dog sled trip covering 2000km over 5 weeks, and every year he takes a month out to canoe the vast arctic wilderness that he calls home. Being originally from the Lakes, the great outdoors and outdoor activities formed an integral part of Blue's life from as far back as he can remember. He'd climbed the 5 highest mountains in England before he was 12 yrs old. At 15 Blue began canoeing, originally as a means of keeping in shape on the wet days when he couldn't climb. His 15th summer also saw the beginning of a career in the outdoors with his first instructing job at Denton House LEA centre in Keswick. He left the Lakes at 18 and went to work in Spain, then Italy and finally ended up in France – leading groups down the Ardeche Gorge. Blue managed his first outdoor activity centre when he was 21 yrs old. In the 21 yrs Blue has worked and lived in the Ardeche area he has lead in excess of 1200 canoe expeditions in 10 countries over 3 continents. 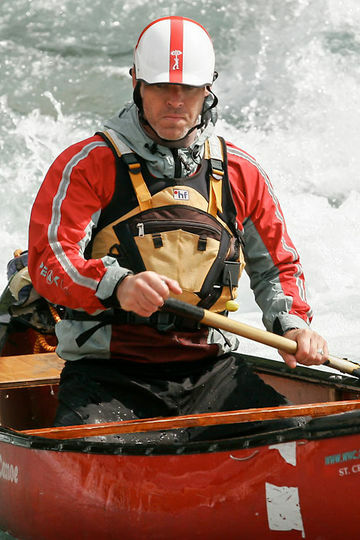 He loves the challenges that are posed by canoeing on open and moving water in remote locations. Blue has spent 27 yrs and over 25,000 hours attempting to master the canoe but he still considers it to be a means to an end; a beautiful means, but it's the journey that counts. Blue lives with his wife, Caroline and their daughters in a small village at the bottom of the Ardeche Gorge. He provides high quality courses in canoeing and adventure training as well as outfitting and guiding across the southern Alps, Massif Central and Ardeche. Blue is a BCU UKCC Trainer and Assessor. He also holds a number of qualifications in several outdoor activities and is a keen scuba diver. 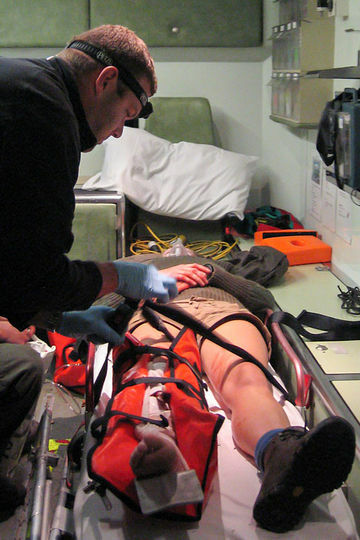 Jamie is Woodlore's medical training Instructor and provides all of the first aid and medical training for the Woodlore team as well as the wilderness first aid courses. He, and his wife Sharon, have been working with Woodlore for over 8 years. Jamie is a State Registered Paramedic with over 20 years' worth of experience in the emergency services starting in the Fire Service where he served for 6 years, then on to the ambulance service and now as a volunteer crew member for the Severn Area Rescue Association, a UK Mountain Rescue station as well as the largest independent lifeboat organisation in the UK serving on the infamous river Severn, the serene river Wye and the Usk. The organisation provides mud and rope rescue as well as search and rescue locally and if required, nationally. Jamie is a Resuscitation Officer in the local acute NHS trust involved in teaching all grades of medical staff and is an Advanced Life Support (ALS) Instructor for the Resuscitation Council (UK) and an Advanced Paediatric Life Support (APLS) Instructor. Flint Knapper Will Lord grew up at Grimes Graves, a group of Neolithic flint mines in Norfolk. Together with the support of his father, John Lord, Will mastered the art of flint knapping. Will has developed his skill to a level and knowledge of its uses in the Stone Age and now delivers this with a clear and interesting approach. He uses the same tools and methods to work the stone as had been used in the past, such methods include quartzite and basalt hard hammers and deer antler soft hammers. Flint knapping with Will is a great way to unfold the complexities that you will be faced with in the stone and gain access to the minds behind the tools that remain with us today from vast distances into the past (Great Britain 1000,000 years to 3500 years ago). 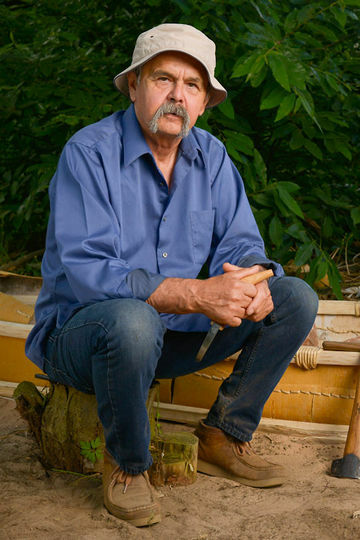 Daniel Smith, or Pinock as he is known within his community and surrounding area, was born in 1950 and was raised on the native reservation of Kitigan Zibi and is of the Algonquin Nation. Kitigan Zibi, being a poor community with very little work in those days, meant that many people depended on Nature to help them meet their needs. As a child and a part of his earlier years, Pinock was therefore exposed to his native culture and many of the old skills being practiced, whether it be in birch bark works like canoes, baskets, shelters, snowshoe making, making clothing from tanning hides, sleighs, toboggans, etc. Although I was never formally taught I am definitely not self-taught, I was taught from the school of life and I had good teachers, grandparents, parents, and the whole community, so a little did rub off on me. Pinock has had a varied employment history including farm work, factory work, guiding, forestry, but most of the time he has taught in schools, college, and for the past 25 years he has been earning his lively hood from nature and his culture, either in giving workshops, demonstrations, or just talking about his culture, which he enjoys. 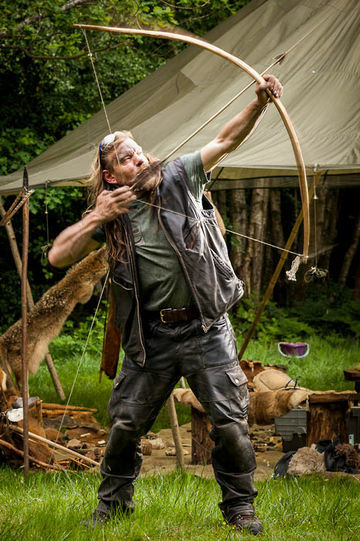 In 2004 Pinock joined Ray in Canada to build a birch bark canoe for the television series Bushcraft Survival, and we are now very pleased to welcome Pinock into our camp and offer a special course based on this for our 30th Anniversary. Claudia was born and raised in the Austrian Alps, surrounded by woodlands and mountains. The forests were her childhood playground and it was there that she discovered the subject of her fascination; fungi. As they were a mystery to many, and the people around her only knew a very select few by name, at five years old, Claudia decided to find out everything about them. Claudia studied mycology under some of the world's best tutors - such as Professor Meinhard M. Moser and her always supporting friend Dr. Uwe Passauer, now retired Head of "Cryptogam Collections" at the Museum of Natural History, Vienna. Furthermore, she attended many seminars alongside top international mycologists in countries such Austria, Switzerland, Italy, France and Finland to widen her experiences. Since then Claudia has lived and worked in Scotland, primarily as a painter and ceramicist. 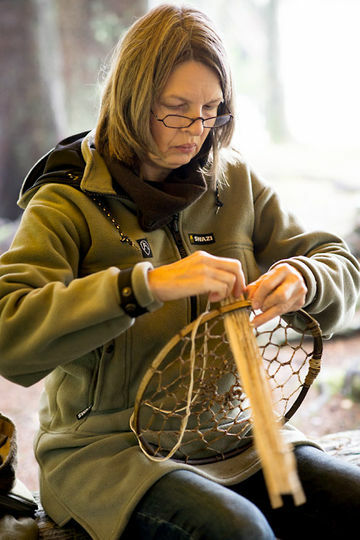 Still being passionate about mycology, she finds joy in teaching students within the Woodlore Journeyman courses, helping to make them feel confident in collecting fungi by sharing her knowledge and experience. Matt Larsson-Clifford leads the Heroes of Telemark expedition in Norway under the guidance of Brian Desmond. Matt served with the British military for over 16 years, specialising in physical and outdoor education. Prior to his career in the military, Matt worked in the outdoor industry and gained a Diploma in Outdoor Activities, a BEd Hons in Outdoor Education and many high level qualifications in mountaineering, skiing, kayaking, seakayaking and open canoeing. Matt retired from the Royal Air Force (RAF) as one of the leading specialists in Adventurous Training (AT) and as a Fellow of the Institute in Leadership and Management. His final position was as the Commanding Officer of the largest Force Development Training Centre in the RAF. 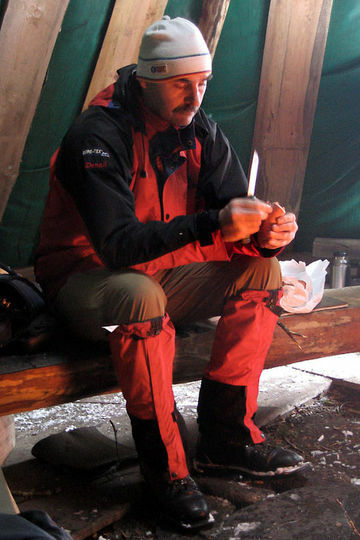 During his time in this position, Matt set up and led a variety of overseas annual expeditions which still today exposes more than 1000 RAF personnel a year, to the benefits of AT; including Ski Touring and Mountaineering in the Alps, Wilderness Open Canoeing in Sweden, Sea Kayaking in Norway and Nordic Ski Touring in Sweden. He was also privileged to have led expeditions throughout Europe, Africa, USA and Canada. On leaving the RAF in 2013, Matt retired to Sweden where he and his family built their own house and are currently developing their own small-holding and forest. Matt also set up 'Sweden Outdoors Coaching' where he has worked as an AT consultant for the RAF, the United Arab Emirates Military, Human Behavioral Performance Training (HBP Trg), Charitable Trusts, The Swedish Canoe Federation and private customers. Matt continues to use his high-level qualifications to develop individuals and teams in the outdoors, both in the mountains, forests and on the rivers and sea, and since 2013 has worked all over Sweden and Norway, the Alps, Scotland, UK and North Africa. Matt ran the first RAF 'Heroes of Telemark' expedition with Brian Desmond in 2011, and since then has spent many weeks developing his knowledge and experience of this amazing story whilst leading various groups on the Hardangervidda. He is now excited to be involved with the Woodlore program teaching, leading and guiding on the Heroes of Telemark expedition.